We just wanted to let you know about some of the major changes to the site we have been working over the past several weeks. We will be on a bit of a repost hiatus as we do the same things for the other sites in our network but all Seller Submitted ads will still go up within 24-48 hours. After a long time and many requests we have finally fixed the old outdated Ad Submission form. The new process does not spin forever or throw a 404 error like before. In fact if you already have a Craigslist, eBay, RV Trader or other classifieds ad, you can simply submit your details and the link, along with a few other important items. Due to requests from sellers we have also expanded our services to include additional promotions, support and management. This includes more social media exposure and even some paid advertisement and phone support. The FREE option is still available, we just wanted to offer more marketing for those looking to sell their motorhome faster. 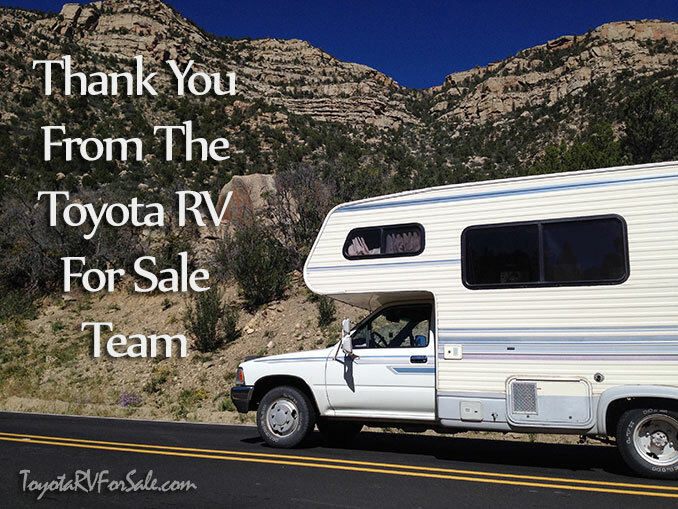 See our new packages and list your Toyota RV with us on our Ad Submission page. Another long overdue project was to cleanup all the old archived reposts from years and years ago. We have gotten emails, comments and some people yelling at us for all the old stuff. Sorry our bad… The idea was to keep a rolling archive for fair market pricing. An early oversight was the ability to manage those reposts. Now we have a new method where we link to the original ad source which will expire after 90 days. You will find that most of the nearly 1,200 listings are now marked as SOLD or No Longer Available to properly reflect the status. We kept these there for those who still want to use them for research, but in order to help make the search for current listings easier we have added both a Recent Listings area along with improved search functionality. Recent listings is the place to start for buyers and we will be tracking what visitors search, so when we see trends we will be able to adjust the site accordingly. The Featured Section is still the place to go to see the seller submitted ads where we have direct communication with the seller. You will still find many available here. So bundle up for the winter and stay tuned we will be working on numerous improvements to make the site better for RV season in 2019! If you have any comments, suggestions or just want to say hi, drop us a note on our Contact Page.